Electric rates in Kansas have received plenty of attention recently. But what are the facts? Most people only think about the cost of electricity when the monthly bill arrives. It may be hard at that time to recognize the value it represents – four full weeks of heating and cooling comfort, refrigeration, lights, meal preparation, clothes washing, drying and ironing, television and other media entertainment, computer, internet and cell phone charging. Electricity has simplified household and professional chores and improved the quality of life – and our life expectancy. And you can still get significant value out of a few cents’ worth of electricity. You can power a 9-watt LED lightbulb – the equivalent of a 60-watt incandescent bulb – 12 hours for just a couple pennies. A penny’s worth of electricity will power a microwave for about 4 minutes and a desktop computer for nearly 30 minutes. Where else can you get that kind of value? The government can’t even make a penny for a penny anymore. According to the U.S. Mint, it now costs 1.5 cents to produce one. Value can also be measured in other ways. Investments by utilities in environmental and regulatory upgrades have cut emissions and cooperatives in Kansas are leaders in emission-free energy production. For example KEPCo provides its 19-member cooperatives more than half their energy supply from emission-free sources. 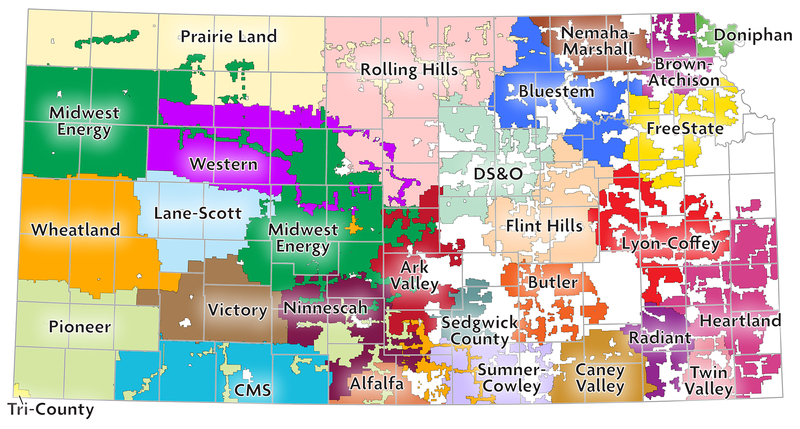 Rural Kansas expects and deserves an energy generation mix made up of varied sources. The rural electric cooperatives of Kansas invest in and generate energy from wind, solar, hydro, nuclear, natural gas, and coal every day for our members to insure safety, affordability, and reliability. Co-ops are required to serve all members during times of peak demand, but they serve solar customers in a very unique way. Using the cooperative only as a “back-up” still creates costs for the utility. Fixed costs for connecting distributed generation such as solar remain constant, even if an individual’s energy purchases decline. Solar customers make an individual investment in private generation, and we are happy to serve their energy needs, but other non-solar customers must not subsidize those users. As the Kansas Legislature continues to discuss the future of energy in our state, we have kept as priority the collective and best interests of our more than 280,000 consumer-members. Our current position is in support of the substitute version of SB 69. Kansas deserves a fair and realistic energy plan that can deliver the best solutions for all of us. Sub SB 69 will authorize a study to be conducted by consultants who will review a list of 29 topics that may uncover some opportunities for utilities and customers to manage electricity costs in the future. The bill also calls for a study of several issues that might benefit large industrial utility customer but raise rates for homeowners and small businesses across our state. So we are cautious about this new legislation. If the consultants chosen by the Legislature are objective and thorough, there may be some beneficial recommendations. If not, their conclusions could be harmful. What works in some parts of the country that an out-of-state consultant is familiar with may not be a good fit in Kansas. The costs that you and your neighbors pay at the end of the electric line is critically important to us. As nonprofit cooperatives that belong to the communities we serve, we seek only to cover the costs of providing energy and our overhead. We share excess revenue back to the people we serve. Rural Kansas may often be overlooked by some in our state but know we are working to educate all state legislators as to your importance and the reliance you have on energy for your livelihood. Electric cooperatives will continue to advocate for the needs of our consumer-members throughout the state in the discussions of our state’s future. The Electric Cooperatives across Kansas support a realistic energy plan. Read the most current version of the bill here. Advocates claim that retail wheeling will benefit consumers, but experience and research shows this form of deregulation results in complication without a guarantee of cost savings. A market price doesn’t mean a lower price. It means being subject to the fluctuations of a volatile energy market that may be attractive today but could be wildly different in the future. Utilities in states with retail wheeling have had to divest their generation resources and, in turn, invest heavily in public education campaigns and marketing departments to communicate with potential customers. Advertising budgets balloon. Power suppliers come and go, creating a possible consumer protection issue. Electric rates in Kansas have received plenty of attention recently. But what are the facts? It’s true that some Kansas utilities have been regularly increasing rates for several years and now average electric rates are higher in Kansas than our neighboring states. It’s also true that special interest groups are active in the media and the Kansas Statehouse calling for utilities to slash electric rates. It’s not true that such a step would lower rates for your electric cooperative. READ MORE to learn more and take action! Who doesn’t want to save money on their utility bill? Electricity rates in Kansas have risen but they are still near the national average. For many years, Kansans have benefitted from electric rates that were well below the national average so frustration is understandable. Utility rates differ widely, not only between states, but between the other utilities in Kansas. Besides Evergy and the other investor-owned utilities, there are 28 rural electric cooperatives and 118 municipal utilities in Kansas that make sure the lights are on, your food stays cold, and your phone stays charged. Rates for each of those utilities vary because costs vary and no two cooperatives are exactly alike. Each is shaped by their communities served, each with specific needs. Some of the electric cooperatives in Kansas serve fewer than two customers per mile of line which means higher rates. The Kansas Corporation Commission, in a 220-page study released this year, identified the causes of rising rates and notes that a settlement related to the merger between KCP&L and Westar includes a promise of no rate hikes for five years. Most electric cooperatives have been able to hold rates steady for all classes of customers over the past few years despite many cost pressures from regulatory requirements and obligations to construct and pay for transmission that serves wind resources generated in Kansas but delivered to other customers in other states. Fixing that subsidy for wind would be one relief. Other things to review should include state laws which created some subsidies and shortcuts for energy development that may have run their course. The Kansas Legislature could cut utility bills for businesses by phasing out the 6.5 percent sales tax they pay on energy when no sales tax is collected on residential bills. In addition, The Kansas Constitution assesses utility property at 33 percent but other business property is assessed at a 25 percent rate. Is the Kansas Legislature Working on This? Legislators are being asked by special interest groups to consider sweeping and punitive legislation that could benefit those groups but have a negative impact on industry reliability, rates and customer service. There are certainly some more measured ideas that could be reviewed as part of a discussion among legislators, regulators, utilities and other affected parties. THE ELECTRIC COOPERATIVES WILL SUPPORT BEING PART OF A TASK FORCE THAT BRINGS THESE PARTIES TO THE TABLE. We should explore our current energy picture and work toward a balanced energy policy for the future. It deserves a deliberate and respectful process that will take some time, but our energy future is worth the investment. After all, we all have the same goal — for Kansas to continue to be a great place to work, play, raise a family and call our home. Discussions on restructuring the way consumers purchase the generation component of their electric bill, a system called retail wheeling, often ignore detrimental impacts experienced in other states. Dozens of energy providers will offer multiple rate plans and marketing schemes which often lead to consumer protection issues. And in most states with retail wheeling, rates are still higher than those in states retaining a rate structure similar to Kansas. Most importantly, a market price doesn’t mean a lower price. Energy prices in a restructured industry can be very volatile.